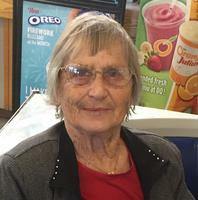 Provide comfort for the family of Maxine Friesen with a meaningful gesture of sympathy. FUNERAL DETAILS: scroll to the bottom of the obituary. TO MAKE A DONATION: scroll to the bottom of this page. 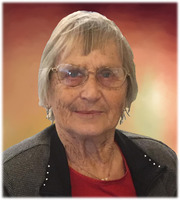 Maxine Friesen passed away peacefully on March 21, 2019, at 4:37 p.m., with family beside her holding her hands and face while hearing reassuring words of love and kindness and the promise we will all be together once again. Maxine Irene was born on September 22, 1934, to Ludwig and Karoline Armbruster, together with her twin, Noreen. She was baptized and confirmed at Christ Lutheran Church in Neudorf, SK, and attended Pheasant Hills School half a mile away from their farm. Because both her parents descended from Austria, German was Mom’s first language. She learned English later at school because it was required, but she always spoke German with her sisters. Mom worked hard all her life and was a natural, loving care giver. Being one of the oldest, she helped raise her younger sisters and brothers so that her mom could sleep because her mother was also a very hard worker in difficult times. Mom’s brothers and sisters remember her going out to work and coming home at Christmas with two big parcels of presents for all her younger siblings; they still remember those gifts today. She also used to make parcel orders for clothes for her sisters and brothers. Growing up they had nothing; mom said for Christmas they would get nothing more than Christmas oranges and some brand name cereal. Mom worked hard on the farm and stayed at home longer than most. She stooked 250 acres by herself every year with her dad, she shoveled grain, milked cows, chopped wood, scrubbed clothes on the scrub board for all of her brothers and sisters. She was up when the sun rose; her sisters said she was the one that made sure they were all warm in the winter. Mom could carry 100-pound bags of flour, yet was only 115 pounds herself. 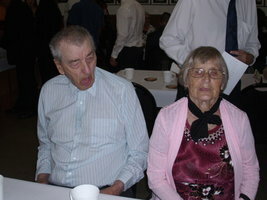 Later on she moved off the farm and worked as a live-in nanny and care giver for numerous families; she cleaned their houses, cooked meals and looked after their children for many years until she met George Friesen; they got married on September 23,1966, and then started their own family, having two sons, Robert and Kevin. Mom and Dad were faithfully married for 52 years, and their little family grew to also include one grandson (Robert’s son, Skylar) and two great-grandchildren (Skylar’s children, Evalyn Maxine and Skylar Jr.), all of whom were very precious to her. The family would always say “there’s little Maxine and big Maxine”. Evalyn was a very precious treasure to her, being the only girl in three generations of family and also sharing her name, but she loved her great-grandchildren equally; she loved children very much. Mom gave complete unconditional love to everybody in the purest form. To get on her bad side meant that person must have done something quite terrible to her, as she was a very forgiving person all the time. Mom worked for 14 years at Chow’s Cafe, serving at banquets every week; Jim Chow, the owner, said she was their best worker; she also volunteered at St. Paul Lutheran Home for many years. Mom loved dancing very much and was a member of the local seniors dance group for many years; she was full of life and happiness, always giving everybody a genuine smile full of love and acceptance to everyone she saw. She was an excellent painter, making lots of beautiful paintings. She was a terrific cook and baker; although she didn’t do it commercially, she definitely knew her way around the kitchen, making everything from scratch. She canned fruits and other foods and always gave us healthy meals every day; nothing came from a can. Mom enjoyed gardening and picking berries and flowers. She was known to be a fast runner and won many sporting events in school, one which was the three-legged race with one of her cousins. Her sisters say she used to ride horses a lot, and you could hear her whistling songs loudly in the distance on her horse named Dexter. Mom loved people and socializing; she took great pleasure in everybody and had a gift for remembering everyone’s birthday, who was related to whom of probably almost everybody in Melville. Everybody was a little treasure to her, and she was a happy soul her entire life. Mom even played a little bit of harmonica (about 10 polkas and waltzes). She didn’t do a lot of traveling, but she did go to a few places; she was in Las Vegas in 2007, her biggest trip, and experienced walking in the middle the desert; we stopped to take a picture of her standing by a 20-foot tall cactus. 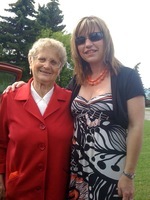 She went to Vancouver three times, Victoria on the ferry, Calgary, Edmonton, Winnipeg, Red Deer, and all over Saskatchewan, taking great pride in her grandson playing hockey and coming on the team bus with everybody. She was at every game in Melville or out-of-town, as she just loved hockey; she enjoyed seeing her grandson score many goals, but one goal in overtime in the playoffs putting Yorkton out was one that she remembered right to the end of her life. When he scored, she jumped in the air so high the other fans must have thought she was only 20 years old. Mom loved many people and many people loved her. Her physical beauty became better and better the older she got; she took great pride in her cleanliness, clothes and appearance. But it was her inner beauty that very few can match; she was just born with one of the kindest hearts that God has given someone and that was what made her a woman with class. Mom will be painfully missed by her family and friends. Just before her passing, you could see in her face she was looking at something very good; that was God she was seeing. She passed away with a smile of relief on her face. In Mom’s passing, God received one of his best back with him, and she now will be watching over her loved ones from above as a guardian angel. Maxine was predeceased by her parents Ludwig and Karoline Armbruster; her brother, Harry; and sisters Sylvia Crayne and Viola Goebel. She leaves to mourn her passing: her husband, George Friesen; sons Robert and Kevin Friesen; grandson Skylar Friesen; great-grandchildren Evalyn Maxine Friesen and Skylar Jr. Friesen; brothers John (Sharon) Armbruster, Jerry (Edith) Armbruster, Ernest Armbruster, Magdeline Johnson, Noreen Anderson, Gladys Friesen Wihlidal, Marlene Sitter, and Sharon (Tom) Haywood; sisters-in-law Leona Friesen and Alice Friesen; along with many relatives, extended family and friends. Donations are being accepted for: St. Paul's Lutheran Church, Melville. We encourage you to share your most beloved memories of Maxine here, so that the family and other loved ones can always see it. You can upload cherished photographs, or share your favorite stories, and can even comment on those shared by others. Condolences Rob, Kevin, Skylar & grandkids. Just wanting to pass on hugs to all. Your mom & grandma was a terrific warm hearted lady whom I thoroughly enjoyed watching hockey with all the years that Skylar & our Tyler played together. She was your hugest fan Skylar & it showed at every game she attended. George was the 2nd hugest fan. Sorry I was unable to attend the funeral but just know that she is up in heaven baking & visiting with everyone which she had a natural knack for. Again, hugs to all. Hi Rob, Meant to call you but kept getting distracted. Curt may already have extended our sympathies. I am hoping that, as painful as it may be, that you still find peace in all that has transpired over the last couple of weeks. There will be questions unanswered but I pray that your faith and your Mom's faith in the Lord will give you the reassurance that there is life better than what we have in this earth. I know you will be okay... and I hope that your Dad is coping well with this. Again we, Curt and I, share your grief and sorrow. Tears are God's gift to us. our holy water. They heal us as they flow. It is with the heaviest of hearts that I write this. I will try put into words what my heart feels. I have so many fond memories of Auntie Maxine(my Mother's twin sister),aka," my other Mother" as we were so close. We may forget what people say to us but we never forget how they make you feel. She always told me I was her girl, she made me feel so loved and special. She spent many days at our family home when I was a baby and toddler. As a child, I spent a week or two at her house every summer.We would go for daily walks, go shopping, talk, and LAUGH! In fact, we would laugh so hard our sides and stomachs would hurt! I remember going to the ladies wear shop on main street and help her pick out an outfit or two. I was so proud that she asked my opinion! She always made me my favorite meal, hot dogs, Kraft dinner, and strawberry Nestle Quick to drink! Occasionally we would walk to the Dairy Queen and have a Mr.Misty or a banana split! One of my fondest memories was the day she asked me to be her flower girl for her wedding! I felt like a princess ,as I drove in the car with her and Uncle George that special day . She kept telling me how cute I was and how much she loved me. I was so proud to stand beside the beautiful bride, my Auntie Maxine! I thought that life was about to change for me as three new loves entered her life,Uncle George, Bobby, and Kevin. I was wrong as I was still her girl and continued to spend many summers with her and her new family. She still had so much love in her heart, that is one of the many reasons I loved her so much. She was an amazing,loving mother, wife,and auntie. I moved to Alberta thirty five years ago but we never lost touch. She loved my husband and children , which was so important to me. We would always correspond at Christmas and visit every time I came to Saskatchewan. We shared and celebrated many special milestones together. Her and her family attended my wedding in Medicine Hat in 1983, she came with my parents to meet and visit us when our son was born in 1987 . She also came to Medicine Hat a couple more times to visit just because. Every time I visited Melville ,we would enjoy coffee dates at the Dairy Queen, lunches at the Melville Flamingo restaurant, dinner and lunches at The Chalet in Yorkton , as well as Melville Senior Hall dances on Thursday afternoons. Being twins, we celebrated many of her and my Mothers birthday together. I was honored to attend and celebrate her and Uncle George's 50th wedding anniversary a few years ago. In closing I would like to raise my glass to Auntie Maxine in Heaven, as I know that is where she is ,as someone that lovely couldn't possibly be anywhere else.Thank you for your love, kindness, and patience. And thank you God, for giving me the best Auntie in the world! I forgot to mention the joy and excitement she had when she became a Grandmother to Skylar and Great Grandmother to Skylar's children. She loved those children with all her heart. She will be missed by so many. Proudly Serving the Communities of Melville, Duff, Balcarres, Lemberg, Neudorf, KIllaly, Grayson, Otthon, Waldron, Bangor, Dubuc Stockholm, Grenfell and districts.